As the sole e-commerce manager for my company, I’m tasked with developing and implementing plans with goals to increase: revenue, customers, transactions, average sale value, referrals, and feedback. Each of these metrics are, bottom-line, sales objectives. To put it simply: we aim to increase business. There are so many tactics and activities used in e-commerce it can be overwhelming. You want a strategy to reach your audience, ensure your store converts into buyers, and foster these new relationships. Leveraging each steps of the sales process effectively against your resources (time and budget) is what will raise the bar on your goals. What we need is a simple, surefire way to manage all of our marketing tactics. I like simple, and it is our company culture to cut out waste. With those ideals in mind, here is a series I developed to help you strategize, prioritize, manage, and measure all elements of your your own e-commerce marketing plan. This three-tier division is designed to tie every aspect of your work to your big goals and objectives. Underneath our objectives are our tactics…. 2) Tactics – “Tactics” are the parts of your marketing strategy formulated to reach a specific objective or goal. Each of these tactics have the activities to execute to achieve that goal. (Examples of tactics are: SEO, Social Media, Shopping Feeds, A/B Testing, Product Reviews, Customer Surveys.) Every tactic is placed in one (or more) objective-based groups and is measured in the goals of that group. For each tactic, we have numerous activities. 3) Activities – The actual marketing work you prioritize, schedule, develop, and execute for each tactic in your marketing arsenal. Marketing Strategy spreadsheet – As we continue below, this spreadsheet will guide you along organizing all of your marketing goals, tactics, and activities. Do you want more sales, leads, revenue, purchase amount, customer feedback? Of course you do, you want all of these things – this is e-commerce, baby. Make a list of all marketing goals on the spreadsheet. Each of your goals should be quantifiable, and you have access to the means to measure them. Be specific if you want (with measurable increases, of say 10% new customers next year) or you can figure out the actual metrics later. Choose whatever goals you want, but my suggestion is to make sure anything you set as a marketing goal will contribute to the business economy. In my opinion, goals like “awareness” in marketing are time-wasters as far as e-commerce goes. Who care if someone knows you have a Website or sell a certain brand of product for X dollars? We want purchasers, advocates, and a storefront that converts like mad. Here is the Marketing Strategy document again; download it now and define your own goals and objectives, or use mine, whatever you prefer to do. Remember – a marketing “tactic” is not something you “do”. 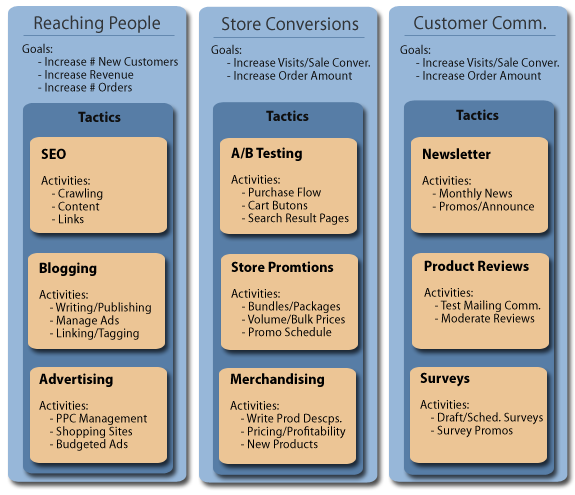 A tactic is a part of your marketing strategy formulated to reach a specific objective or goal. Example: Someone may say they’re “doing SEO“, but what does that mean? “SEO” in itself isn’t an activity; it is a tactic. SEO makes up a myriad of activities like writing content, building links, editing Page Titles, etc. This is where you think bigger than your everyday work. Do not overwhelm yourself trying to list every activity you do right now. Some groups share tactics because these tactics have more than one goal/objective. For example, “product reviews” is a tactic to raise buyer trust on our product pages (and therefore, increase sales conversions), but we also contact customers via e-mail 3 weeks after purchase and request a review. These e-mails keep our customers interacting with us and sometimes referring repeat business. One of our communications goals is to repeat transactions, and since we can test and improve this with A/B testing, it’s a storefront conversions tactic as well as a customer communications tactic. It’s fine if your tactics cross objectives. Just be sure each tactic’s goals are in line with the groups they are in. “Activities” are the day-to-day work either you or your staff are responsible for executing/implementing. Activities are your finished projects; they are the content of your Project Management chart, your production and implementation of marketing work that produce the results you’re after. You may have ten activities or a thousand activities. If you’re know you’re going to do it, add it to the list. We’ll work on scheduling them later, so right now just fill up the list.